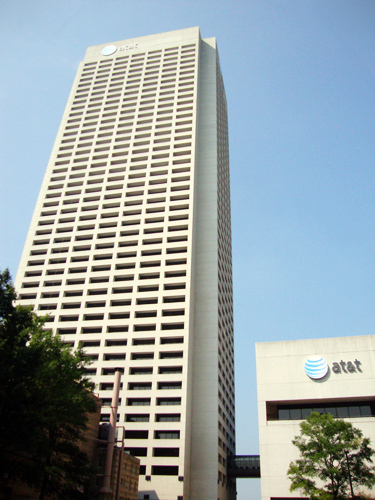 Built in 1982, the AT&T Building was originally the regional headquarters for Southern Bell, which became Bell South. Ownership of the building transferred to AT&T when it acquired Bell South. The white concrete, 47-story skyscraper is immediately adjacent to the Fox Theatre situated at the corner of Ponce de Leon and Peachtree Street. Also incorporated into the structure is the North Avenue MARTA Station, which was built in conjunction with the construction of the AT&T Building in the early 80s.